I make things -- books, knitted items, crocheted angels, and anything else I can find to make. Here I will write about my adventures in creating. I really like the movie Frozen. The Broadway-style songs are great, and it's an interesting change that there's no real "bad guy" (well, there is towards the end, but that's almost an aside). My kidlet loves it, and so does every other child, it seems. 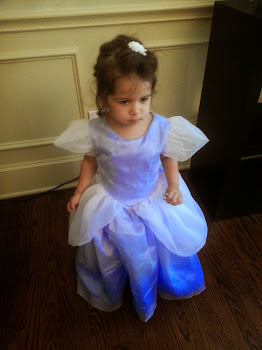 Mine thankfully wants Anna's dress (thanks, Spoonflower!) - pleated cotton and embroidered suedette I can happily do. 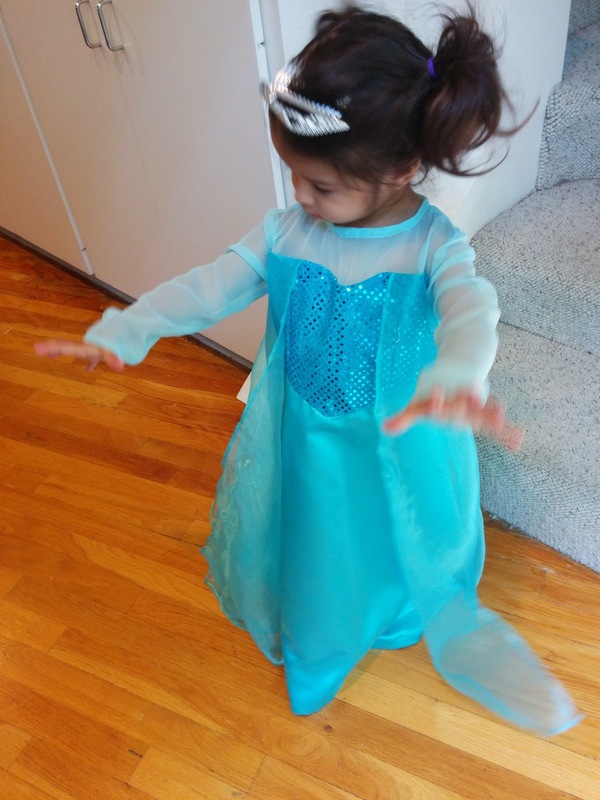 All the other kids, however, want Elsa's snow queen dress. I've had three orders for one, and made a fourth for trial of fabrics and patterns. You must pose with a crown if you're a queen. JoAnn's wisely has all the ice-blue shiny fabrics pulled on a display table. 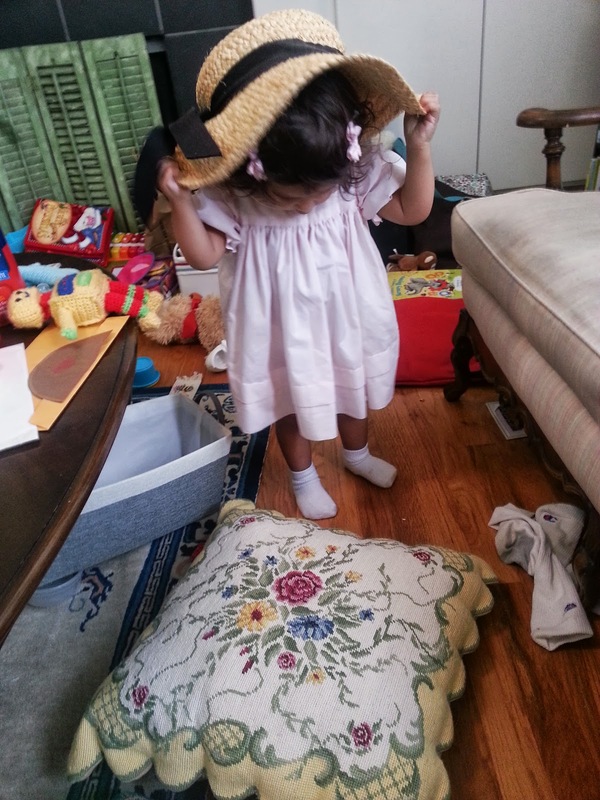 Size 3-4 is a bit large on a toddler. 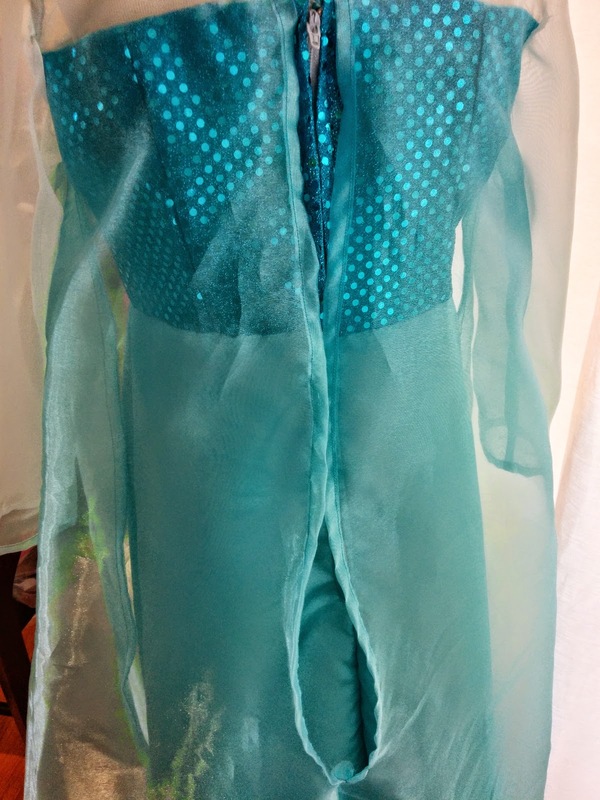 Simplicity gets the Disney contracts, but McCall's made the pattern first, so it's called "Winter Princess," delightfully. 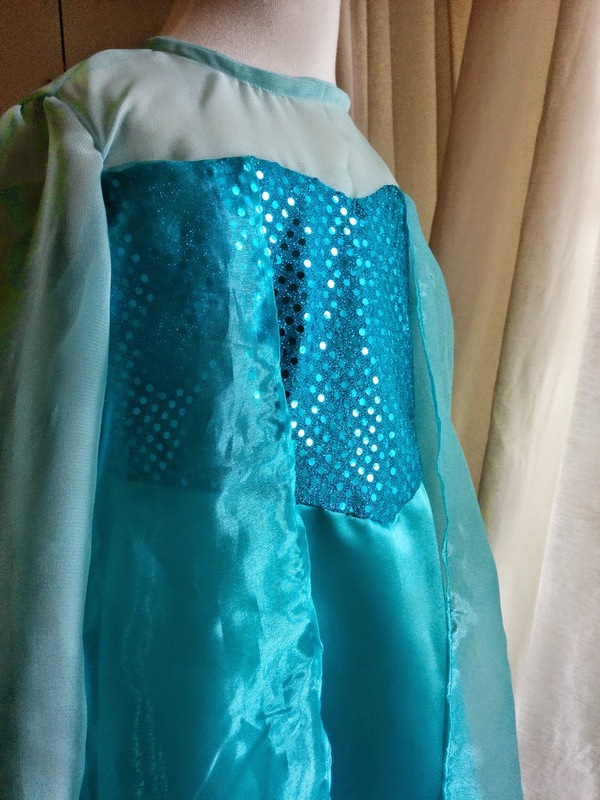 Other unofficial Frozen-inspired products from other companies also have silly names to avoid trademark issues - at Sparkle Skirts it's "big sister" and "little sister". The odd underarm cape certainly met with her approval. Hadn't made an attached cape from the yoke (rather than neck) before, and I rather like it - it doesn't pull at the neckline at all, especially as it attaches around past the arms (as in the movie, though I'll likely move it a little further out - this pattern comes perhaps a bit too far in). The finished product, ready for Etsy if anyone wants it - if nobody wants it in a year, kidlet will have grown into it! 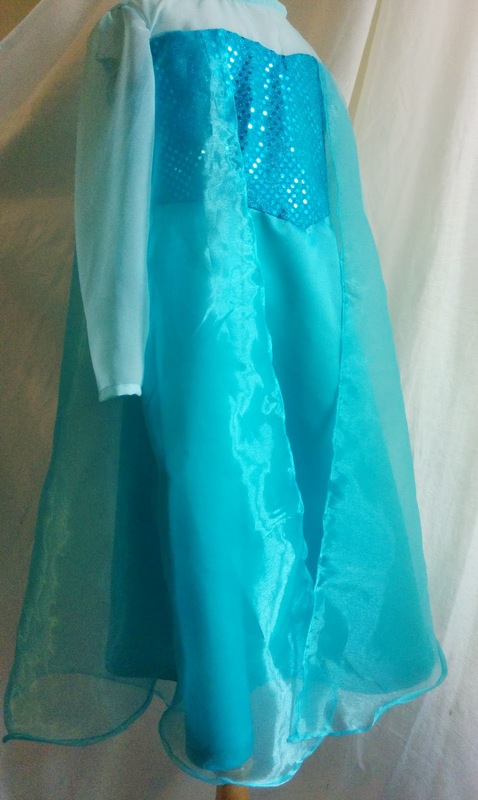 Made with spangly stretchy stuff, costume satin skirt, shiny organza cape, and a nice chiffon for the sleeves. I'm glad I did the trial run - these spangles are all glued on and it did a number on my machine - needles get gummy, thread won't glide along gummy needles... I've got a metallic crinkle overlay for the other dresses! 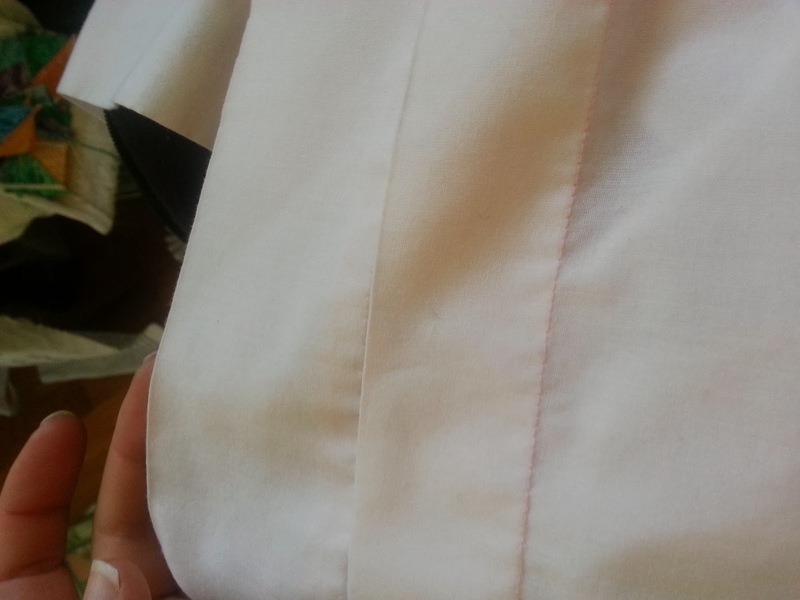 Zipper and big placket in the back. 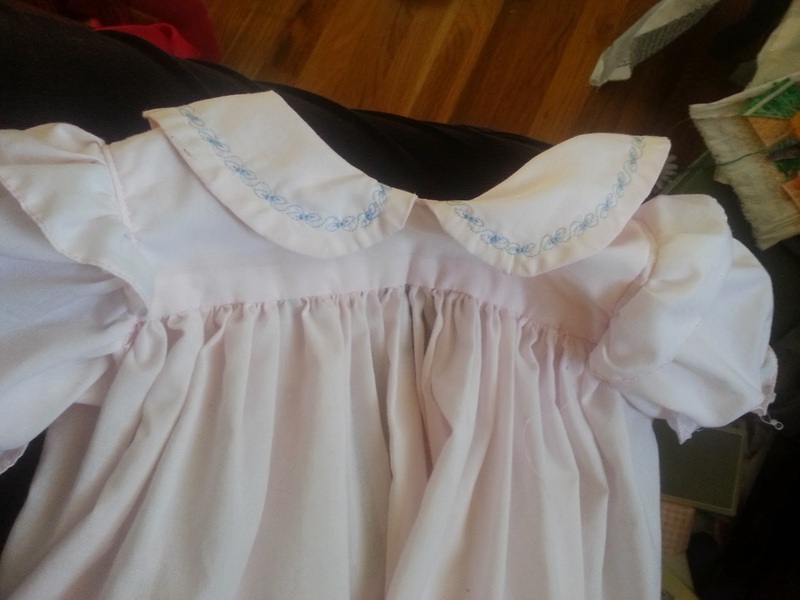 I may alter the placket a bit for the subsequent dresses. One round of fray-y shiny sparkles down, three to go! 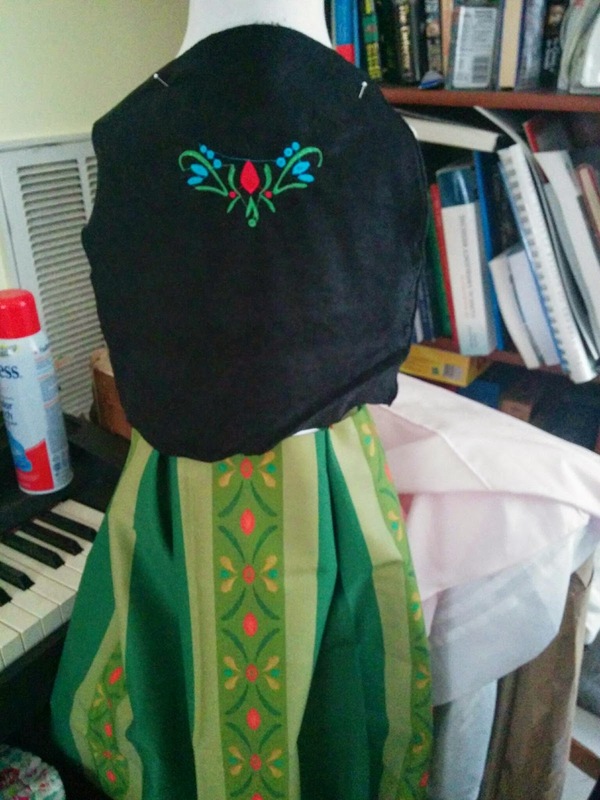 In progress: at the request of the kidlet, Princess Anna's coronation dress from Frozen. 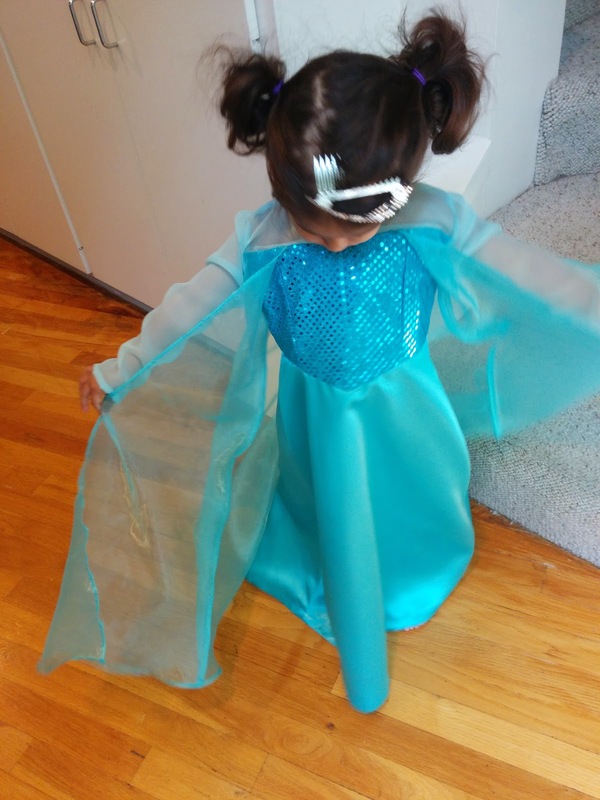 Better that - cottons and fake suede - than Elsa's ice queen dress, all stretch sparkles! 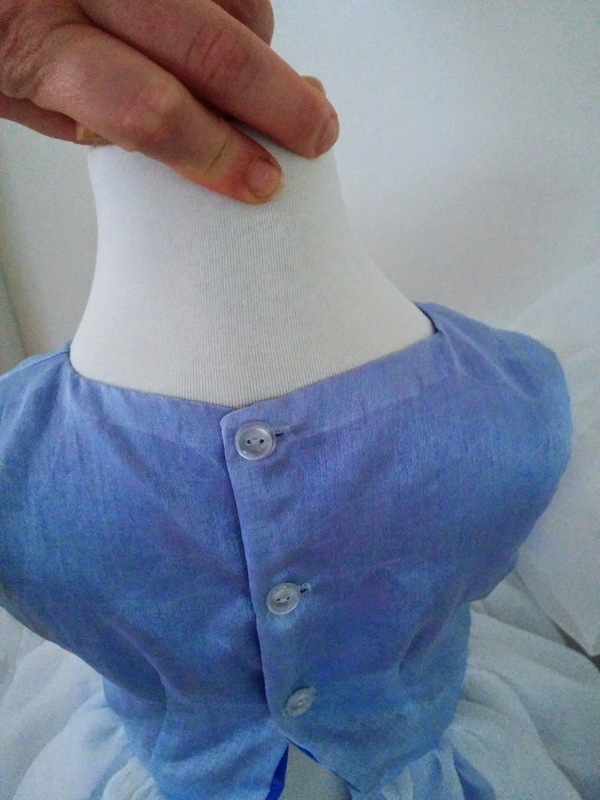 A trip to Spoonflower (once I decided my fabric painting skills are nonexistent) and to Etsy for embroidery files and I'm good to go - a mannequin makes drafting so much easier! 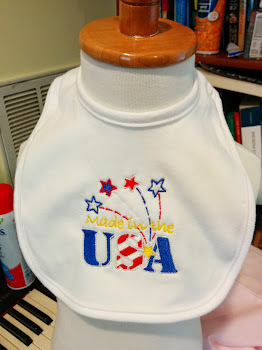 Made only one thing, not the full outfit for the kidlet I had planned - just a hostess gift for a cookout, with the June design from the Martha Pullen Internet Embroidery Club. But I've finally gotten embroidery on knits down! 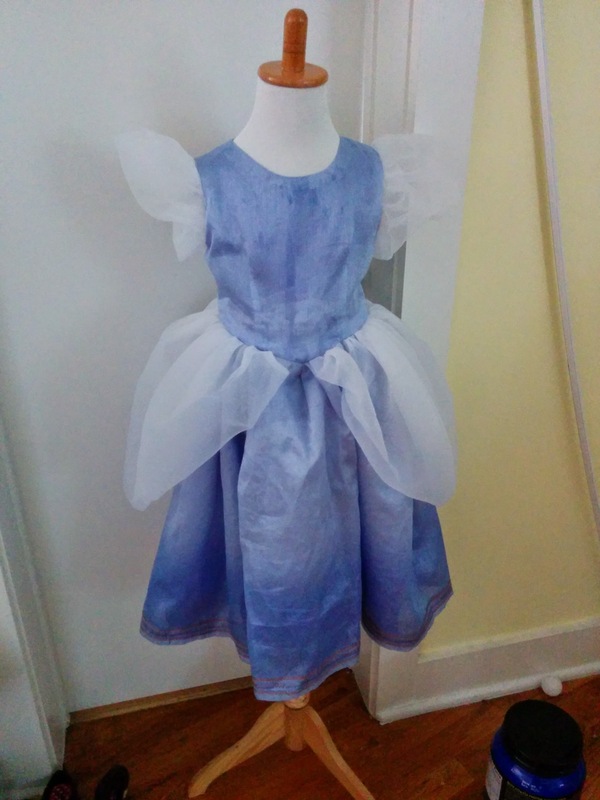 I didn't like the Simplicity Cinderella pattern, so I modified the "generic princess" view of Butterick 4320 for this pattern instead. I used a very nice rayon crepe to line the bodice and an old silk-poly blend sari for the main dress, and poly organza for the puffs. For the pannier-things, I cut a large organza circle (30" or so), folded it in half, and gathered the edges (two layers together), then pinned and attached as I attached the skirt. 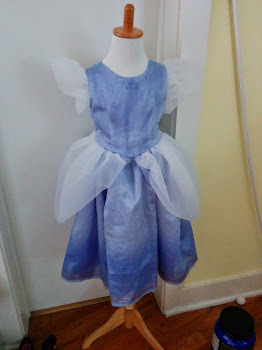 I'm very pleased with this, as it looks more like the "real" Cinderella than the official patterns! Kidlet liked it too. Frowny hot party-weary toddler approved! 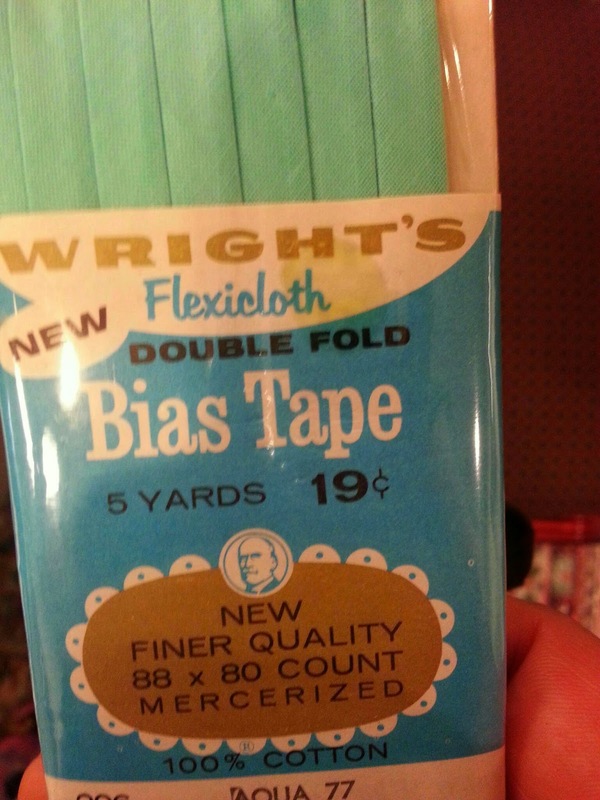 Always entertained by old notions - you got a lot more for a lot less back then! Back when she was tiny, I made the kidlet (now 2!) Chery Williams' Baby Square Yoke dress in a 6 month size. My first dress on my mother's Bernina that she kindly gave me, with sweet decorative stitches on the collar and lots of exciting work with the edgestitch and rolled hem feet. 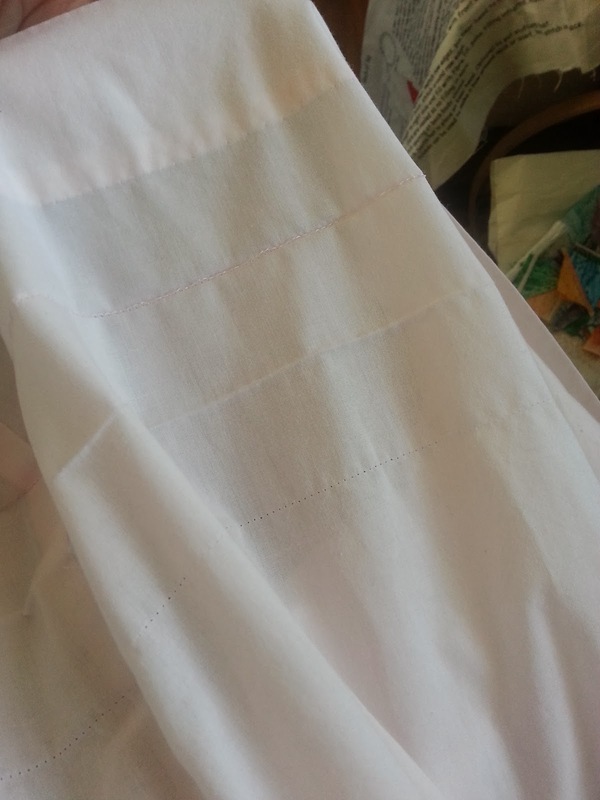 My first attempt at heirloom sewing. 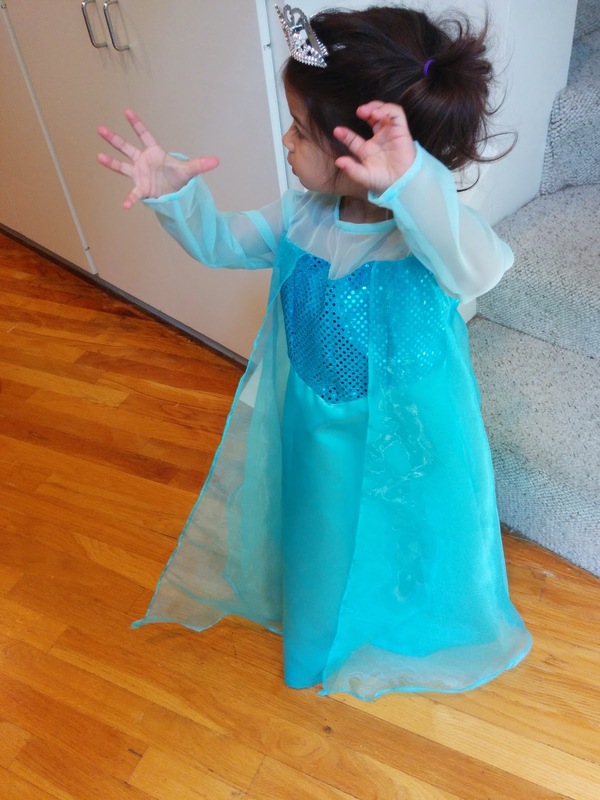 It was quite big (though she wore it much of her second spring and summer, just after turning 1), and very long (especially for a crawler), so I put in a big tuck that made the dress look even cuter. Going through clothes to put away as too small, I found this one still fits, so out came the seam ripper, out comes three inches of growth tuck, and my kidlet's wearing a size 6 month dress comfortably into her second year! 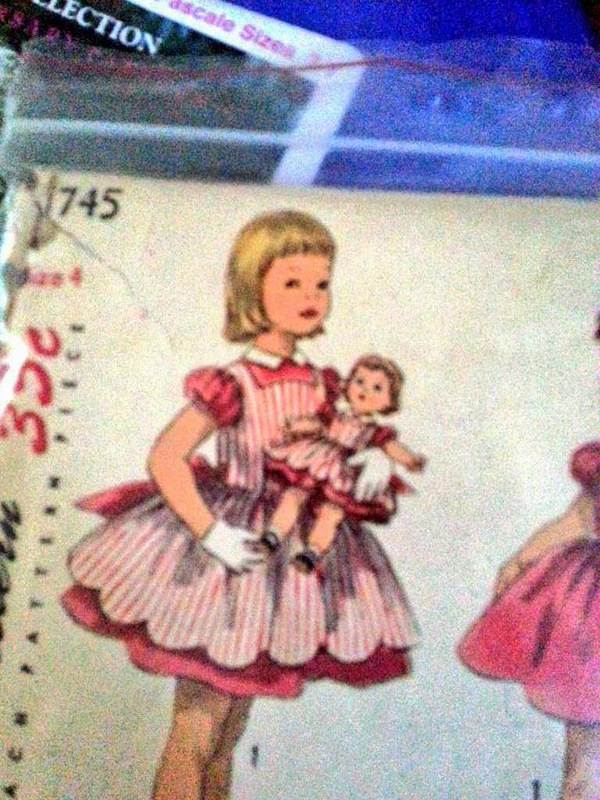 In honor of the day, here's two cute views from a 1956 Simplicity pattern I picked up at the Quilt Show! 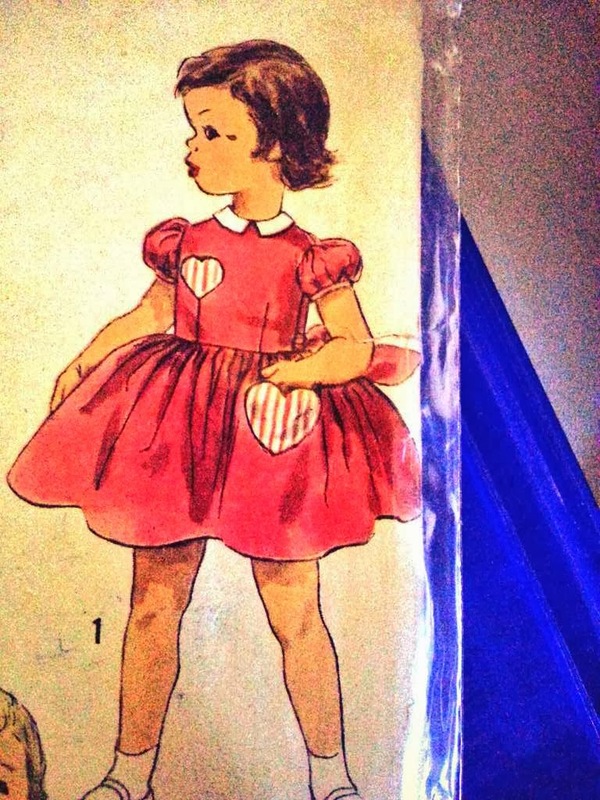 1950s kids' clothes are excellent. And it's a size 4 (back when patterns came in one size), and my monkey wears a 1, so I have lots of time to get around to making it!